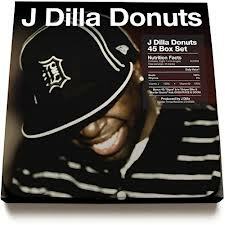 Indie rap powerhouse Stones Throw Records recently announced that it’s planning to release an all-vinyl box set of J Dilla‘s Donuts. The project began in the summer of 2005 as an idea to turn a good demo beat tape into a full length release, eventually becoming a classic of modern hip hop. The special edition eight record box set will include wax pressings of hard-to-find singles from the legendary Detroit producer and emcee. Among these singles are the out-of print Fan Club 45 featuring Oh No and Roc C, Murder Goons, and Sniper Elite featuring Ghostface Killah and DOOM. Side D contains the Donuts Outro/Intro appearing as an interlude at the beginning of The Diff’rence which dates back to the first, original sequence of the album.